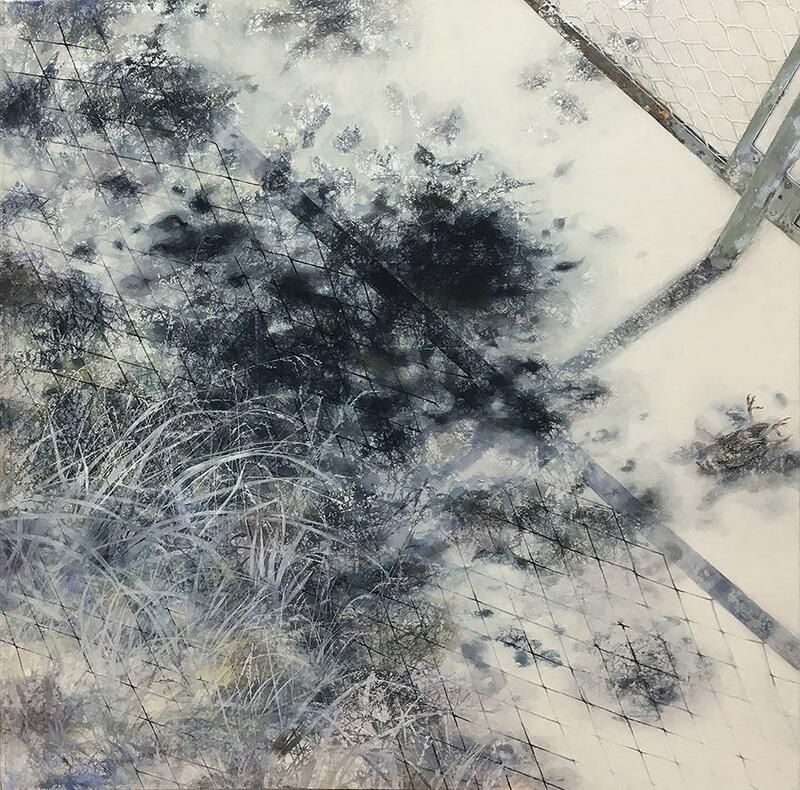 Art Front Gallery is pleased to announce Saho Suzuki's solo show. Before the disaster in 2011 hit Northern area in Japan, there was a stone memorial with a poem from “A Grasp of Sand” by Takuboku Ishikawa (poet, 1886-1912) located at Rikuzen Takada, unfortunately been washed away to the sea by Tsunami. When I encountered works by Saho Suzuki, depicting shadows casted on the ground, for the first time in Tohoku University of Arts and Design (located in Yamagata, in the Northern Area in Japan), they reminded of me of Takuboku’s lines which stimulates our imagination with limited number but provocative words. From the details of the work, I was able to understand artist’s interest to reality, and reflected upon the disaster and its impact given to our life. Not only Takuboku, but Kenji Miyazawa (poet and writer, 1896-1933) or Ken Domon (photographer, 1909-90), many artists and writers from Northern Area tend to start from their interest in society and real life. From each of their understanding of the contemporary world, their works are opened to wide range of reading toward the future. I also was able to find unfolded narratives in Suzuki’s painting, the same tendency from her predecessors. We may able to say that Suzuki started her career as an artist under the environment of Northern tradition, but her motherland, city of Komoro in Nagano, may also have influenced her sensitivity. Komoro is an old town where we can feel the layers of history creating the town today. Unlike many young artists working in large cities such as Tokyo, her working style may naturally come from her experience living in this small town giving her a notion that the contemporary world is not merely about the world today, but consisted of layers of time piled up naturally from time to time to make the given reality. She does not necessarily have to be caught by the tradition of ink paintings, or does not need to struggle to overcome the limitation of the traditional method. She does not need to concentrate too much on the superficial topics to catch up with the world today, or to get lost in the maze of popularity or fashion by erasing her personal motive to create the work. She is naturally working from her interest and how the interest has encountered the world. I feel that she may have already found the reason to create what she has to. This is, for me, a rare case for young artists. Her works may not have flamboyant outlook like popular music to attract huge audience. But I believe that contemporality is different from popularity. Some works of art, literature or music shall survive after today to become the great work of that period, without totally being consumed within that period. Artist’s motive to create a work shall meet the readers with imagination and they shall still be provocative after our time. Unfortunately, contemporary art in Japan is still not ready to have certain status toward the future, when we reflect upon the past 100 years later. Suzuki may still be in the initial stage of her career, but she may be one of few artists who may have such possibility to become contemporary art. We shall sometimes try to ignore “new” or “popularity” and reflect upon the condition of good art projects. By curating this exhibition, I came back to my old question again.